Public holidays in the United Kingdom are days where most businesses and non-essential services are closed, although an increasing number of retail businesses (especially the larger ones) do open on some of the public holidays. There are restrictions on trading on Sundays and Christmas Day in England and Wales and on New Year's Day and Christmas Day in Scotland. Public holidays are often referred to as bank holidays (but see the reference to "common law holidays" below). In Scotland, while New Year's Day and Christmas Day are national holidays, other bank holidays are not necessarily public holidays, since the Scots instead observe traditional local custom and practice for their public holidays. In Northern Ireland, once again, bank holidays other than New Year's Day and Christmas Day are not necessarily public holidays. Good Friday and Christmas Day are common law holidays, except in Scotland, where they are bank holidays. In Scotland the holiday on 1 January (or 2 January if 1 January is Sunday) is statutory. If New Year's Day is Saturday a substitute holiday is given on 4 January by Royal Proclamation. 2 January is given by Royal Proclamation, with a substitute holiday on 4 January if it is Saturday and 3 January if it is Sunday or Monday. Outside Scotland, 1 January is given by Royal Proclamation, or 3 January if it is Saturday and 2 January if it is Sunday. In Scotland, 25 December is a statutory holiday (or 26 December if Christmas Day falls on a Sunday). 26 December is given by Royal Proclamation if it is neither Saturday, Sunday or Monday. 27 and 28 December are given by Royal Proclamation if Christmas Day is Saturday. 28 December only is given if Boxing Day is Saturday. Outside Scotland, if Christmas Day is a Sunday there is an additional statutory holiday on 27 December. By Royal Proclamation, if Christmas Day is a Saturday there is a substitute holiday on 28 December. If Boxing Day is a Sunday there is again a statutory holiday on 27 December, and if Boxing Day is a Saturday there is a substitute holiday by Royal Proclamation on 28 December. Effectively what happens is that if a holiday falls at the weekend a substitute day is given in lieu. Like Denmark, the United Kingdom has no national day holiday marked and/or celebrated for its formal founding date. Increasingly, there are calls for public holidays on the patron saints' days in England, Scotland and Wales (Northern Ireland already has St Patrick's Day as a holiday). An online petition to the Prime Minister for a public holiday in Wales on St. David's Day received 11,000 signatures; the Scottish Parliament has passed a law creating a public holiday on St Andrew's Day, although it must be taken in lieu of another public holiday; campaigners in England are calling for a bank holiday on St. George's Day; and in Cornwall, there are calls for a public holiday on St Piran's Day. Bank holidays are holidays when banks and many other businesses are closed for the day. Public holidays are holidays which have been observed through custom and practice. by statute (Statutory holidays) - Holidays specifically listed in the Banking and Financial Dealings Act 1971, Schedule 1.
by Royal proclamation - This has been used for annual bank holidays created since 1971, and is also used to move a bank holiday in a given year, and to create extra one-off bank holidays for special occasions. (The Act does not provide for a bank holiday to be suppressed by royal proclamation without appointing another day in its place). Unlike the USA, where public holidays falling on a Saturday are sometimes observed on the preceding Friday, British public holidays are always moved to a later date, not an earlier one. Although there is no statutory right for workers to take paid leave on public holidays, where paid leave is given (either because the business is closed or for other reasons), the public holiday can count towards the minimum statutory holiday entitlement. Likewise, if people are required to work on a public holiday, there is no statutory right to an enhanced pay rate nor to a day off in lieu, although many employers do give either or both. Any rights in this respect depend on the person's contract of employment. The statutory minimum holidays are currently 5.6 weeks a year (including any bank holidays or public holidays that are taken). 1 January New Year's Day from 1974, by Royal Proclamation. Currently not proclaimed if 1 January falls on Saturday or Sunday. 2 January not named By Royal Proclamation, only in a year in which 1 January is Sunday. 3 January not named By Royal Proclamation, only in a year in which 1 January is Saturday. Easter Monday Statutory bank holiday, defined by name. Last Monday in May Spring Bank Holiday Statutory bank holiday from 1971, following a trial period from 1965 to 1970. Replaced Whit Monday, which was formerly a public holiday whose date varied according to the date of Easter. The legislation does not specify a name for the holiday, merely when it occurs. Last Monday in August Late Summer Bank Holiday Statutory bank holiday from 1971, following a trial period from 1965 to 1970. Replaced the first Monday in August (formerly commonly known as "August Bank Holiday". The legislation does not specify a name for the holiday, merely when it occurs. 26 December (see Notes) Boxing Day Statutory bank holiday. Legislation does not name the holiday, but states that it falls on "26th December, if it be not a Sunday." 27 December not named Statutory bank holiday only in a year in which 25 December is either on a Saturday or Sunday. This has the effect of adding an extra holiday when Christmas Day falls on a Sunday. 28 December not named By Royal Proclamation (example for 2015). This is an extra holiday added when either Christmas Day or Boxing Day falls on a Saturday. In 1968–69 the new "August" bank holiday fell in September. This was as a result of the decision to move the holiday to the end of the month, and the nearest Monday being taken. The current definition was introduced in 1971. 7 June 1977 was made a special bank holiday as part of the Silver Jubilee of Elizabeth II. The wedding of Charles, Prince of Wales, and Lady Diana Spencer on 29 July 1981 resulted in an extra bank holiday. In 1995 the May Day bank holiday was moved to 8 May as it was the 50th anniversary of VE Day. 31 December 1999 was a one-off bank holiday as part of the Millennium celebrations. 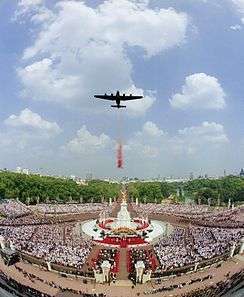 In 2002, there was a special holiday on Monday, 3 June, to celebrate the Golden Jubilee of Elizabeth II. The Spring Bank Holiday was moved from 27 May to 4 June to make it a four-day weekend. There was a special holiday on Friday, 29 April 2011 to celebrate the wedding of Prince William and Catherine Middleton. In 2012, there was a special holiday on Tuesday, 5 June, to celebrate the Diamond Jubilee of Elizabeth II. Therefore, to make it a four-day weekend, the Spring Bank Holiday that would usually have occurred at the end of May was delayed until Monday, 4 June 2012. Most bank holidays are not recognised in Scotland, as public holidays are generally determined by local authorities across Scotland. Some of these may be taken in lieu of statutory holidays while others may be additional holidays, although many companies, including Royal Mail, do not follow all the holidays listed below, and many swap between English and local holidays. Since Easter 1996 the Scottish clearing banks have harmonised the days on which they are closed with those in England and Wales and are therefore closed on Easter Monday and the last Monday in August (rather than the first). This has resulted in a number of local authorities creating a public holiday on Easter Monday. Previously Easter Monday had not been a public holiday in Scotland. Note: In 2012, there was a special holiday on Tuesday, 5 June, to celebrate the Diamond Jubilee of Elizabeth II. Most areas in Scotland did not have Monday 4 June as a holiday. 1 2 3 4 5 6 7 UK Bank Holidays, Retrieved 2011-10-26. 1 2 3 4 5 6 Why are bank holidays called bank holidays, Retrieved 2011-10-26. 1 2 3 4 5 6 When is the next Bank Holiday?, Retrieved 2011-10-26. 1 2 3 4 5 6 7 Department for Business Innovation & Skills: Bank holidays and British summertime, Retrieved 2011-10-26. 1 2 St Andrew's Day Bill. ↑ Banking and Financial Dealings Act 1971, Sec.1(1), Retrieved 2011-10-26. ↑ Banking and Financial Dealings Act 1971, Sec.1(2), Retrieved 2011-10-26. ↑ Banking and Financial Dealings Act 1971, Sec.1(3), Retrieved 2011-10-26. ↑ - Bank holidays and British Summer Time, Retrieved 2011-10-26. ↑ Her Majesty's Government (23 September 2016). "Holiday pay: the basics". Retrieved 17 October 2016. ↑ Citation (2016). "Holiday Entitlement". Retrieved 17 October 2016. 1 2 3 4 5 6 7 Banking and Financial Dealings Act 1971, Schedule 1, Retrieved 2011-10-26. ↑ Time and Date: Spring Bank Holiday in United Kingdom, Retrieved 2011-10-26. ↑ Time and Date: Whit Monday in United Kingdom, Retrieved 2011-10-26. ↑ "Bank Holidays". NI Direct. Retrieved 25 March 2012. ↑ "The Silver Jubilee: 25 Facts". The British monarchy. Retrieved 20 August 2015. ↑ "1981: Charles and Diana marry". BBC News. 2008. Retrieved 20 August 2015. ↑ Time and Date. "Early May Bank Holiday in United Kingdom". Retrieved 17 October 2016. ↑ "UK Extra millennium holiday confirmed". BBC News. 23 June 1999. Retrieved 20 August 2015. ↑ "'Extra holiday' for Queen's jubilee". BBC News. 24 November 2000. Retrieved 18 August 2015. ↑ Peachey, Kevin (20 May 2012). "Diamond Jubilee: Your rights to a day off work". BBC News. Retrieved 21 August 2015.